You know the story: Last September, David apprehended an armed intruder on his property with an unloaded 22. The local police took his guns away for 6 weeks and suspended his licence, for doing nothing more than trying to protect his family. Then his wife, Andrea, had a condition imposed on her licence prohibiting her from keeping firearms at the family home, while David’s licence was suspended. This caught the attention of the national media, with two appearances on The Project and coverage on many local and regional news services. The reason is simple: even people who don’t like guns could see how badly he was treated. The Deputy Premier of NSW, John Barilaro, visited the Dunstans and expressed his support for them. With your help, the CFCV raised over $20,000 to provide the Dunstans with the legal support they needed. The lawyer we engaged, Stephen Mainstone, did a fantastic job in advising both the Dunstans and ourselves on our options, dealing with the registry and challenging them to make decisions with the timeframes they had. We also had several discussions with coalition authorities in NSW to ensure the political importance of this was understood. 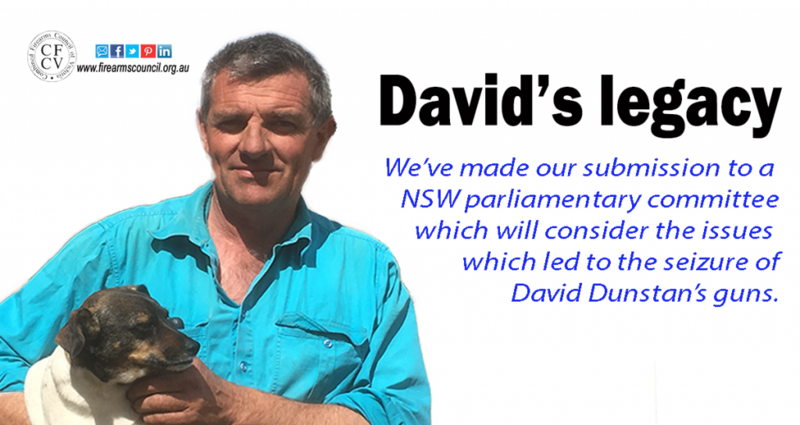 Once the Dunstans got their guns back, we used the remaining funds to ask Stephen to look at some legal questions about changes which could be made to the NSW Firearms Act 1996 to avoid a repetition of this. It was clear from the outset that David was not going to be charged, as there is a defence of self-protection available under the NSW Crimes Act 1900. However, that did not stop his guns being taken from him, because the NSW Police could still seize his firearms for ‘incorrect use’ of his firearm. A person must not possess or use a firearm unless the person is authorised to do so by a licence or permit. (b) contravenes any condition of the licence. This means that if you obtain a firearm for primary production, then that’s all you can use it for. Use it for something else – whether it is target shooting, hunting or protecting your family home – and you risk imprisonment for up to 5 years. While this saga was unfolding, we helped the Dunstans write to Mr Barilaro suggesting simple amendments to the Act which would have helped avoid a repetition. We suggested the NSW Government consider adding the simple clause of ‘without reasonable excuse’ to s7A so that it forces the police – and judiciary – to consider the circumstances in which the firearm was used, rather than ignore them. If these words had been in place last September, then David’s guns might never have been taken away. In November, Mr Barilaro issued a media release saying that he referred this matter to the Law and Safety Committee of NSW Parliament. In his release, he says he has called for an inquiry into the operation of the Firearms Act 1996, but if you read it carefully, you will see his focus is on protection from home invasion which falls under other legislation. He does not seem to be suggesting the inquiry should look at changes to the Firearms Act. In fact, the Terms of Reference for the inquiry include “The current awareness of firearms license holders of their rights and responsibilities” – as if David wasn’t aware of that at the time! Click here to see Mr Barilaro’s release. We’re a bit surprised by that. However the fact this matter was referred to the committee is a positive step and delivers on an earlier commitment he made. Around the same time, we wrote to Mr Barilaro enclosing a copy of advice we received from Mr Mainstone (click here to see that advice). In Stephen’s advice, he responds to questions we asked about the appropriateness of including a ‘reasonableness’ test in s7A, and for other provisions relating to the storage of firearms and ammo (ss39-41). Without this, having a couple of 22s accidently left on the floor of your ute would also be enough to see you have your licence suspended in NSW. We did not hear back from Mr Barilaro, so referred the advice to the Committee late last year ourselves. The Committee will meet later this month. While it is not taking submissions at this time (but might do so after it has met), we’re hopeful they will see sense in adding ‘without reasonable excuse’ provisions where reasonableness can be justified. Getting these changes included would be a small, but useful win. No doubt many of you would hope we would have pushed for more. However, the reality is that the committee’s interest in the Firearms Act is limited, and any changes would need the support of both sides of parliament. If it gets up in NSW, then we can use it in other states to make sure no other shooter has the same thing happens to them – but we need it to come up in NSW first. Consider it David’s legacy. We’ll let you know when we hear from the Committee. I would ask that you also include this part of the regulations:13 (3) The Commissioner may refuse to issue a permit authorising the possession or use of a firearm if the Commissioner is satisfied that the applicant intends to possess or use the firearm for personal protection or the protection of any other person or for the protection of property. This part like so many others need to go. This is well overdue & we should never have been put at risk of our very lives in the first place. To think that legally we are unable to defend ourselves or our families is totally ludicrous & criminal. What sort of government would sooner see people raped & murdered rather than use a gun, pepper spray or a taser to protect themselves???!!! The statement by keith H. Burgess is totally incorrect. If we are going to fight get the fact correct otherwise we have egg on our faces.